Ålsheia skisenter and Tjørhomfjellet (Sirdal Alpint) are merging into a single ski resort with two centres, under a new operating name of Sirdal Fjellheiser. 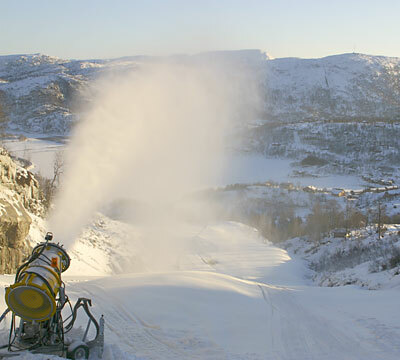 The recent cold weather means that snow-making cannons and other equipment have been running full speed, in addition to 10-15 cm of natural snow in Sirdal. Some slopes will be open from this weekend - 15 December - at Ålsheia. Tuesday has been clear sunny and cold (-8°C) - a beautiful, peaceful day in Sirdal, with the only noise coming from the steady hiss of the snow cannons making the slopes ready for the new season. Some slopes will be open at Aalsheia from this weekend (Saturday 15th December), with more slopes on the Aalsheia side, and slopes on the Tjørhomfjellet / Sirdal Alpint side opening soon, after a little more snow or good snow-production days. From around the second weekend in January the new lift and slopes should be open that will join the two centres together. There will be new runs down from the top of the chairlift, to a new 200 metre button (or tallerken) draglift. From the top of this lift you will have a choice of going left to two other draglifts on the Ålsheia side, or going down a new slope that brings you back to the Tjørhomfjellet express chairlift. Lift passes will be valid for the entire resort, unless you buy a cheaper "Huldreheim" pass, for the family-friendly area in Tjørhomfjellet. With 25 slopes totalling 25 km, and 9 lifts, we will report more on these exciting developments soon.